“In an ‘Active Birth’ the mother herself is in control of her body. She moves and changes position freely – she is the birth giver. Whereas in an actively managed birth, all the power is taken from her, her body is controlled and she is a passive patient.” (Janet Balaskas). A month or two ago we had a student midwife from Ireland observing our team as part of her elective placement. She joined me at a hospital birth for one of my women who was having an induction. As the induction was considered high risk, continuous monitoring was recommended for my woman. We were in a delivery room that looked similar to this. To optimise maximum space and allow my woman to move around and stay active I did the following. During the day whilst caring for my woman in labour my student whispered in my ear that she’d never seen a woman labour so actively. She was use to seeing women on the bed, or lying on their side on the bed. Even when there no epidural on board. She said in the hospital where she trained there where birthing balls and mats but were often kept in the store room and never openly offered to women. She also said that because most the women she had seen were told they had to get onto the bed, they then often asked for an epidural as it was too painful labouring lying down. I often hear women telling me their births stories, and a common theme comes through ‘I had to get on the bed to have monitoring’ or ‘The midwife/doctor need to listen to the baby’s heartbeat so I got on the bed’. There is no rule written in any guideline/hospital policy that says any woman has to be on the bed for monitoring. 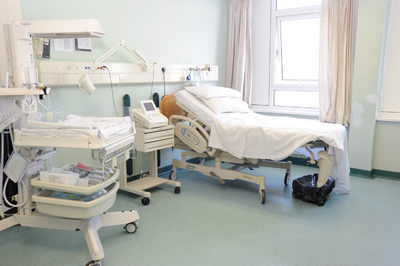 If it is advised that it is safer to monitor your baby’s heart beat during labour with a CTG machine then ask to stand, lean over the bed, sit on a ball because this is your labour and you know the benefits of staying upright. Get your birth partner to ask for the bed to moved, for a birthing ball (or take your own in) or for birthing mats to be put down on the floor. Any unnecessary equipment can be moved out of the way to make space for you to be active. So if you’re pregnant and getting near to your due date, write your birth plan and make sure your birth partner knows all about active birth. There are some great examples of women having active births on labour wards all over the UK. Us midwives know it works and is more beneficial for labour. But maybe sometimes we just need reminding to get off the bed.